The influx of heroin in the metro St. Louis area is taking a staggering number of lives. Two families in St. Charles County talked about how they lost their children to the drug and used the tragic experience to keep other families from going through the same. O’Fallon mother, Gee Vigna, was having trouble with her 17-year old daughter, Nicky. She assumed she was dealing with typical teenage hormones. It never crossed her mind that her daughter could be a heroin addict. One morning Gee walked into Nicky’s room prepared to argue with her about going to school. Instead she found her unconscious. Gee Vigna with her husband and two daughters. Nicky Vigna pictured on the left. “She was on her side, she was frothing out the mouth, she was totally gray. Eyes were rolled in the back of her head, she was ice cold. And you’re looking at her like what in God’s name is going on here. And you’re screaming because you don’t even know what you’re looking at. How can I be talking to a kid one day and the next day I come into her room and she looks like this” said Gee. She didn’t know what was wrong with Nicky until the EMT told her. 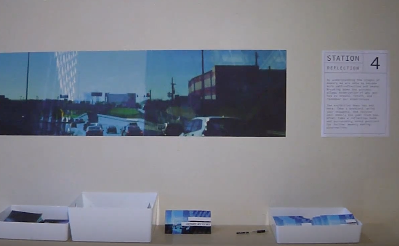 “You’re in the back of the room just horrified because you don’t even know what’s happening. You’re sitting there and he’s like what kind of drugs does your daughter do and I’m like…I say none because I don’t know…And he’s like, you’re daughter’s a heroin addict” said Gee. Nicky’s life was saved that day but her battle with heroin was just beginning. Gee said from that point on her family was on the roller coaster from hell. “The destruction of watching your child absolutely self-destruct in front of you and you cannot fix it. And not only is the self-destruction on her. It’s the whole family” said Gee. Gee realized that Nicky’s addiction was something she would have to fight for the rest of her life. “It was never going to let her go. It never was going to. It was going to be forever” said Gee. Gee never thought she would have a child die from a heroin overdose. She knew that if it happened to her then it could happen to anyone. At that point she made the decision to do everything she could to keep another family from going through what she did. Gee and her husband selling Walking for Wellness merchandise. She started an organization called “Walking For Wellness” to raise awareness and education about the heroin epidemic. “It started off as just a walk. And then the walks led to meeting families who had lost children” said Gee. Gee started making personalized t-shirts that said “Stop Heroin” and taking walks around her neighborhood. That inspired other people to tell Gee their stories of loss from heroin. “The walks are really to generate education, to generate awareness. But also to provide families a venue to come to when they’ve lost a child or a loved one or a sibling or a brother to be able to talk to other families. For people that have current users to talk to people that came there who are in recovery” said Gee. Walking for Wellness travels all around the metro St. Louis area giving education presentations, helping families who have lost loved ones and working with law enforcement to help stop heroin. 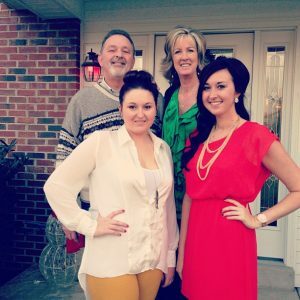 Samantha Dickman has been a part of Walking for Wellness since the start. When addicts go into treatment Samantha and other members will meet with the family and talk to them before they visit the addict for the first time. “It’s the first time that they are going to see the addict since they’ve been in treatment to kind of tell them, ‘this is where your addict is at now and this is the things you’re going to see different about them’” said Sam. Samantha said they also talk to families about the hard stuff that has to be talked about when dealing with a heroin addict; like how they want to be buried and whether or not they have life insurance. “Some people will come up and thank you for being there and other times you see that look of defeat” said Sam. Warrenton mother, Kelli Clodfelter left for work one day with a healthy 17-year old son. Shortly after she got a call saying he was in the hospital. Jordan Lunsford tried heroin for the first time that day. When Jordan became unresponsive, the people he was with loaded him up and drove more than 20 miles and dropped him off at a hospital. It took 40 minutes for doctors to get Jordan to breath again but by then he was already brain dead. Kelli said her small community of warrenton suffered six more overdose deaths within a year of jordan’s. After losing her son to a heroin overdose Kelli also decided she would help her community stop heroin. That’s when she opened Jordan’s Place. Jordan’s place is a not-for-profit teen hang out. Located in Warrenton, Kelli said she opened the safe haven in a place she knew kids could walk to, one block away from where Jordan overdosed. Inside kids will find a pool table, a Playstation 4, basketball and flat screen tv’s. The mission of Jordan’s Place is to give kids a place to hang out and have fun without facing the pressures of drugs or alcohol. 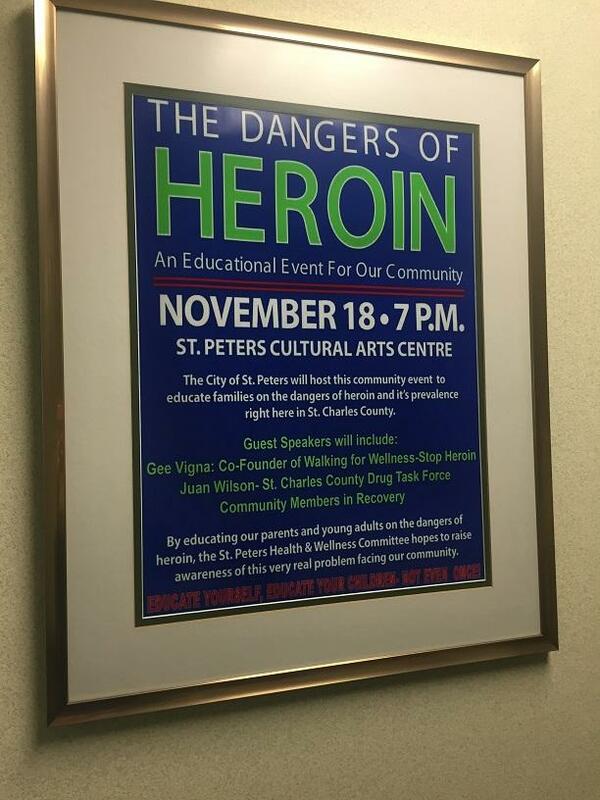 Saint Charles County is making an effort to stop the use of heroin by convincing kids to never even start. A St. Charles County initiative called C.R.U.S.H. or Community Resources United to Stop Heroin, took their message to Orchard Farm Middle School on Thursday. The day consisted of presentations and activities designed to convince kids that no good can come out of doing drugs. The kids heard from a D-E-A officer, a recovering addict, and had a class on the dangers of prescription drugs. Resisting the heroin epidemic is a constant battle for law enforcement in St. Louis and St. Charles. Juan Wilson is a task force officer for the St. Louis division of the Drug Enforcement Association who turned his job into his passion. A typical day for Wilson includes investigating leads and shutting down drug dealers. His job is to find the person who sold the drugs that caused somebody to overdose. He didn’t start his law enforcement career with the intention of battling drugs. After graduating from the police academy Wilson worked as a patrol officer. But it didn’t take long for him to know he wanted to do something more. “I really wanted to get into narcotics. I know I wanted to get into a specialty field and I thought that might be the best way to serve my community” said Wilson. Wilson first knew he wanted to focus on heroin when he lost his father-in-law to an overdose. He spent about two-and-a-half years as an undercover task force officer in hopes of getting drug dealers off the streets. But a normal day at work turned into a day that he would never forget. “Toward the end of my task force time there, I got robbed at gunpoint. That kind of put a lot of things into perspective. Especially since at the time my son was going through chemotherapy and radiation treatment from brain cancer. So I kinda wanted to slow things down” said Wilson. 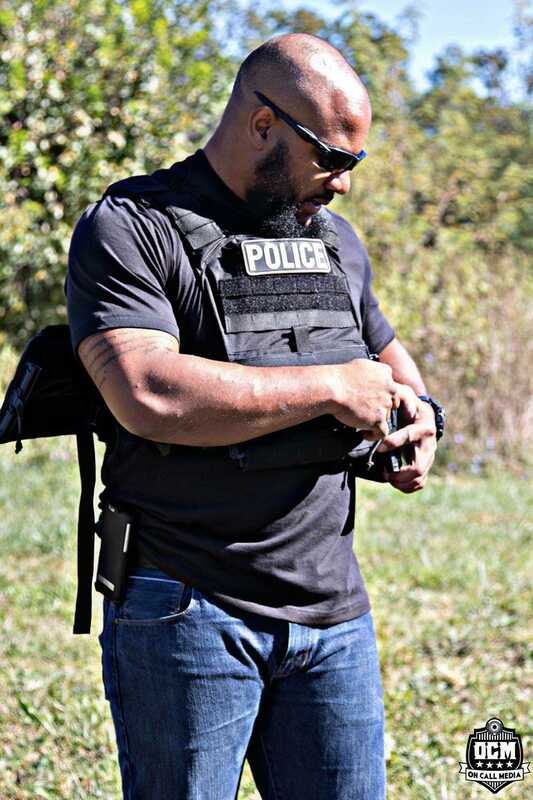 Officer Juan Wilson during DEA training. Wilson moved from undercover in St. Charles to being part of the D-E-A’s task force team. But slow is not the right word to describe his job. Officer Wilson is currently working 35 overdose cases, most of which are in St. Charles County. D-E-A group supervisor Kevin Merkel knew immediately that Wilson would fit in with his team. “I recognized the talent that he has for doing the overdose and the passion that he has doing community outreach and talking with the folks about the dangers of addiction. He’s more involved than any other policeman I’ve ever worked with” said merkel. “You do one thing, there’s so much more that needs to be done. I always feel like I’m not doing enough. And so I’m always trying harder and harder to try to be more vigilant in the community” added Wilson. One group Wilson is involved with is “Walking for Wellness”. He became active after noticing that families who lost a family member to heroin were being treated poorly by law enforcement. He feels joining the “Walking for Wellness” group was a way to end that cycle. St. Peter’s mother Gee Vigna lost her daughter to heroin three years ago. She started the “Walking for Wellness” group to raise awareness and says Wilson is a key player in the local fight against the drug. “As a police officer you can’t be my enemy in this particular case, you have to be my friend and vice versa. He takes the time to meet you. He comes to your house, he learns about your family. He has truly been such a very kind gentle soul” said Vigna. Having two children of his own, Wilson understands the fear of having a child get involved in heroin. He keeps that in mind every time he sees a young person die from an overdose. “Every victim from a heroin overdose that I’ve either arrived on scene or saw the photos; they’re still in my mind, they don’t go away” said Wilson. Wilson is visible in the community is through social media. A strong presence on Facebook and Instagram has helped people who need support after being victimized by heroin find Wilson. You can find his public figure page on facebook under the name Juan Wilson or follow him on Instagram. Naloxone is a drug used to help people who are suffering from a heroin overdose. Walgreen’s Pharmacy already has Naloxone available without a prescription in the 35 states where state law allows. Missouri house representative, Steve Lynch, proposed a bill to make Missouri one of those states. The bill passed with overwhelming numbers through the house and will now face the senate. In St. Peters, Central County Assistant Fire Chief Steve Brown says the law allowing anyone to purchase the drug is an important step to saving lives. “We’ve run a tremendous number of calls in our community where we’ve had patients that have died from opiate overdoses. We want to have all the tools available for us to be able to do the job. And if this is a tool that we can get out into the community that helps save a life, it doesn’t matter, we want it to be out” said Brown. In addition to Walgreens, St. Louis County police officers will also be carrying Narcan in their vehicles. All St. Louis County commissioned police members must go through training before they can use the antidote. Police departments have been able to carry Narcan since 2014 but few have taken advantage of that ability. The medication can also be used as an antidote for other overdoses caused by prescription opioid medications. St. Louis Division Drug Enforcement Administration Task Force Office, Juan Wilson, talk about the ways law enforcement is fighting the heroin epidemic in our community. The DEA is working on implementing federal prosecution for dealers who sell drugs that cause an overdose. They have also started a program called Strategy 360. This program consists of educational presentations given in schools and community centers throughout the area by the officers themselves. Officer Wilson talks about a prescription drug monitoring program that has yet to be implemented in Missouri. The program would allow doctors and pharmacists to talk to each other to ensure people are not overfilling prescription painkillers. Missouri is the only state in America to not have this program. There are several ways that you can join the fight against heroin by joining the organizations talked about today or others in the area. You can join Walking for Wellness by contacting the founder, Gee Vigna. She can be reached on their Facebook page, facebook.com/stopheroin. The group participates in walks every Tuesday, conducts educational presentations at schools in the area and has partnered up with the DEA through Strategy 360. Jordan’s Place in Warrenton is run completely by volunteers. Founder Kelli Clodfelter said they are looking for volunteers who enjoy being around kids and can show the kids that there are adults out there that care about them. You can also find a list of their donation needs on their website. If you or someone you know is suffering from an addiction to heroin, you have options to get help. There are several treatment centers and narcotics anonymous meetings in the area. You can find a list of them at drugabuse.gov. St. Louis also has a 24-hour local help line at 636-946-3771.